Tender cauliflower & broccoli florets. Mature cheddar, free-range eggs. Seeded spelt shortcrust pastry. Camilla's crispy kale & cheddar crumb. Vegetarian Society approved. A lazy-but-lovely Sunday Lunch... 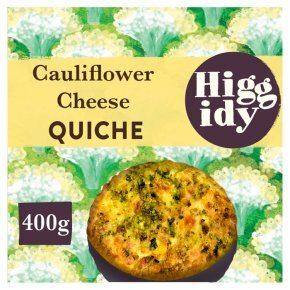 This here Higgidy quiche A pot of good coleslaw Roasted cherry tomatoes on the vine Or some cold cuts from the deli Just arrange on a kitchen table, and dive in. This quiche is ready to eat cold but tastes best heated up. Preheat oven to 180ºC/350ºF/Gas Mark 4. Remove all packaging & place on a tray on the middle shelf of the oven for about 25 minutes.This is a guide only (some ovens vary).Do not reheat once cooled.